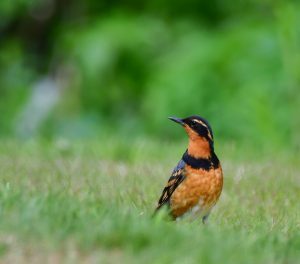 General Information: The Varied Thrush (Ixoreus naevius), a forest loving, secretive bird, is quite common – often heard but not easily observed. It is a member of the Turdidae family (thrushes). 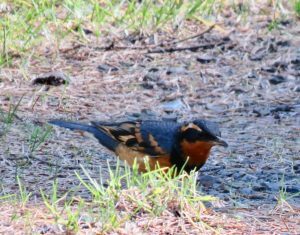 The Varied Thrush’s haunting song is generally first heard and welcomed by local Homer area residents in late March or early April as it announces the oncoming, long-awaited, spring season. Characteristics: When fortunate to be seen, it is not easy to miss this bird with its distinctive plumage: bold black, blue-gray, and orange. Look for an orange eyebrow, wide black collar, orange underparts, blue-gray back and tail, and orange wing-bars. The female and juvenile are similar in color to the male, but duller and generally lacking the wide black v-shaped collar. This bird is about the same size as the American Robin, but stockier. Due to its habitat preference of heavy forest understory, the bird is not readily observed. Be patient. Follow its song and listen for its foraging behavior as it busily scratching the forest floor duff. Preferred Habitat: This bird’s preferred habitat is the dense, mature, unfragmented moist coniferous forest (fir, hemlock, spruce, with a dense understory). It may also be found in Alder thickets and Aspen groves. In the winter, it is often more visible as it frequents parks, gardens, oak woodlands, ravines, and riparian areas. Don’t forget to look up, as these birds can sometimes be found singing at tree tops (dead or alive), often perched for extended periods of time as they throw their heads back and vocalize the presence of their territory. 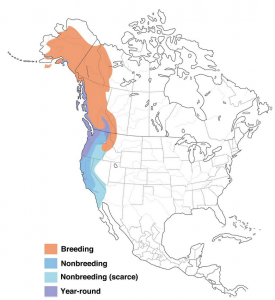 Breeding Season: The breeding season begins in mid-April for those birds in the southern portion of the bird’s breeding range, and in mid-May for those birds located further north – like our birds in Alaska. Nest: The male sings to defend its territory, generally active at dawn and dusk. However, the female is believed to choose the nest site. Nests are built utilizing tree branches, with nests located 4-20 feet up, but close to the trunk; generally, in a small conifer. The female gathers the materials for the open cup nest. The outer layer of the nest is composed of twigs, bark strips, mosses, weeds, and grasses. A layer of rotten wood, moss, mud, or decomposing grasses is then added and allowed to harden the cup. A final nesting layer is composed of fine grasses, dead leaves, and fine moss. The moss is generally draped over the rim and placed on the outside of the nest. Eggs and Incubation: Generally, three-four eggs, but as many as six and as few as one are laid. The pair may have a double brood. The female alone sits on the eggs for 12 days. Chicks are altricial (eyes closed, downy, and unable to feed themselves). The chicks are tended by both parents. 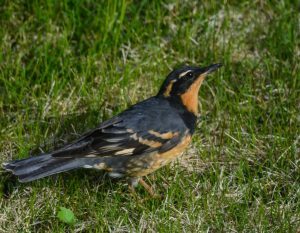 Fledging: It is estimated the chicks fledge 13-15 days following hatching, however, not a lot is known about child rearing and fledging for Varied Thrush chicks. Food Preferences: In the breeding season, the Varied Thrush utilizes protein sources such as insects and arthropods found in the leaf litter, including beetles, ants, caterpillars, sowbugs, snails, earthworms, and spiders. In winter, when insects are few, dried fruits, seeds, and nuts make up their diet. Feeding Methodology: The Varied Thrush forages on the ground, moving dead leaves with a sweeping motion of their bill and then quickly hopping backwards to clear a spot with their feet before checking out their prey. This bird may also forage in low bushes (generally during the winter). This thrush is generally a solitary bird, but in the fall and winter, they may form loose flocks around a good food source. 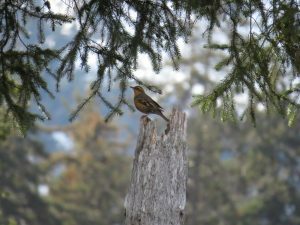 I recently saw seven Varied Thrushes feeding in a state park campground on the northern coast of Oregon. Migration: Spring migration is mid-March to mid-May, while fall migration is from late August to late November. In the winter, many Alaskan birds migrate to the west coast – south Kenai Peninsula of Alaska to southern California. Song: A haunting sound – “eeeeeeeee” (pause) “errrrrrr”. To many this bird’s song sounds like fingernails being run down a chalk board. Threats: Like many birds, loss of forest habitat due to habitat fragmentation and logging is a significant threat. The best conservation strategy is to retain habitat patches of 40-acres or more with habitat connections. Varied Thrushes living around human habitation are subject to window strikes, predation by outdoor cats (domestic and feral), and car collisions. Varied Thrush populations are cyclical, with fluctuations on a 2-year cycle. Conservation Status: The Varied Thrush is fairly common. However, populations have declined over 2.5% per year since 1966. The current global breeding population is estimated at 20 million. 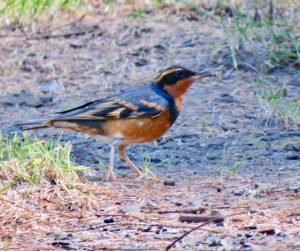 The Varied Thrush does not appear on the Audubon Alaska’s “Watchlist”; and is listed as a species of “least” concern by the International Union of Concerned Scientists (IUCN). The IUCN does note the species population is declining. The National Audubon Society lists the Varied Thrush as a priority bird: climate endangered. BirdLife International. 2016. Ixoreus naevius. The IUCN Red List of Threatened Species 2016: e.T22708385A94159470. http://dx.doi.org/10.2305/IUCN.UK.2016-3.RLTS.T22708385A94159470.en. Downloaded on 13 August 2018.